A new book about jazz is always a fantastic thing BUT a new book about the history of a jazz club is so special that I have to share with you this big news !!! The Jazz Corner is a club situated in South Carolina at Hilton Head Island. This club follows the patterns of the famous jazz history but it is also a work in progress ! Including 2 CD (Cheek to cheek, Amazing Grace, Route 66, A Foggy Day, Hot Hot Hot……..), this book offers as first chapter an introduction to Jazz History, then the Battle of Swing and a chronology of Jazz. The author presents what is so important for me : the musicians ! The first part describes the Bandleaders, then the sidemen, the master musicians and the future master musicians. To end this book, a very surprising section: the Cuisine :-). The Jazz Corner is also a place where you can eat and the best recipes will have no secrets for you. Appetizers like Crab Cakes, The Entrées like Spiced Peach Butter Sauce, the Desserts with the famous Carrot Cake or the Crème Brûlée will help you to combine great food moments and the pleasure of listening the CD’s. You maybe know that I’m French and most of the recipes come from the French tradition but with little variations hmmmm :-). I received it as a present and if I was rich, it would be my pleasure to offer it to you, but… I’m only rich in jazz news and in big smiles. You can buy it via amazon. Outside it’s cold, rainy, snowy… I propose to bring in your house the warmth of the sun 🙂 ! Historic Brazilian Jazz Band revisits Pixinguinha in Rio and that’s what we need ! This band takes elements of the music of Alfredo da Rocha Viana Filho, or simply Pixinguinha, focuses on the Brazilianness, and adapts the typical timbre for jazz atmosphere. Historic Jazz Brazilian Jazz Band combines the musicality of the African percussion of Laudir de Oliveira, the “grooves” and “slaps” thanks to the acoustic bass of Paulo Russo, the ginga battery of Paulinho Black, and the magical touch of Kiko Continentino on his keyboard. They are not alone ! Great performers and masters in jazz collaborate with them. The historical Brazilian rhythm, the real roots and the modernity of the compositions mix musicians of all ages and they all bring the sun at home in such an intelligent way ! When an exceptional place opens the doors, I have to tell you everything :-). This new centre will present world-class artists in concert throughout the year, nurture young musicians’ development and promote music education. In the fall of 1983, SFJAZZ, then known as Jazz In The City, presented two concerts at the Herbst Theatre with a simple philosophy: offer the best of jazz music in an environment that showcases the full spectrum and artistry of the art form. Thirty years later, the SFJAZZ Center will open just two blocks from the site of the first concerts. The Center will be a hub of art, music, culture, and community and will take its place alongside major arts institutions. There will be also Family Matinees which will provide a window into the exciting world of live jazz. Each one-hour matinee features live performance, audience participation, Q&A and amazing music. On March 9, they will dissecting the groove (anatomy of jazz standards). Every season, SFJAZZ Education hosts intimate conversations with international performing artists prior to select performances. This place seems to be so fantastic that I have to share the site on which you will find the information you need. If you travel in the region of Champagne in France, you can mix the favourite drink of Marilyn Monroe AND jazz ! For the 24th year, Charleville Action Jazz proposes concerts ! Tomorrow February 7th, Fabrice Alleman (sax) will play with his “Obviously” New Quartet (Nathalie Loriers – piano, Reggie Washington – double bass, Lionel Beuvens, drum). 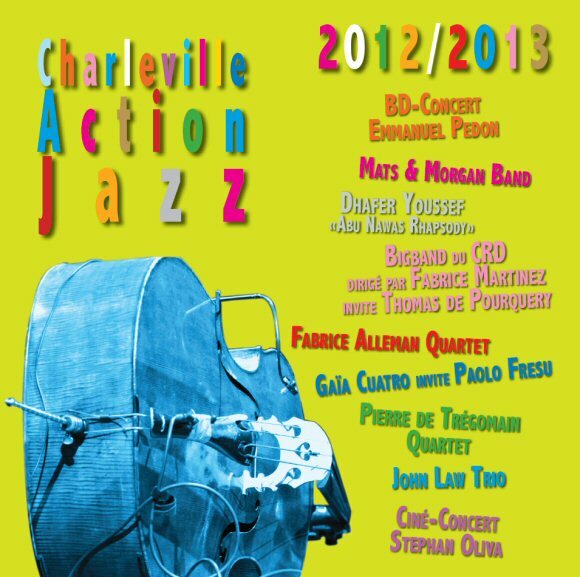 Charleville Action Jazz is an association of voluntaries, in which contemporary jazz is being promoted. They program periodical concerts and organise also master classes and educational sessions.